Your Original Color. Formulated For All Makes & Models Cars. This anti-freeze is recommended and specially formulated for all cars worldwide and light duty trucks with conventional, aluminum and brass radiators. 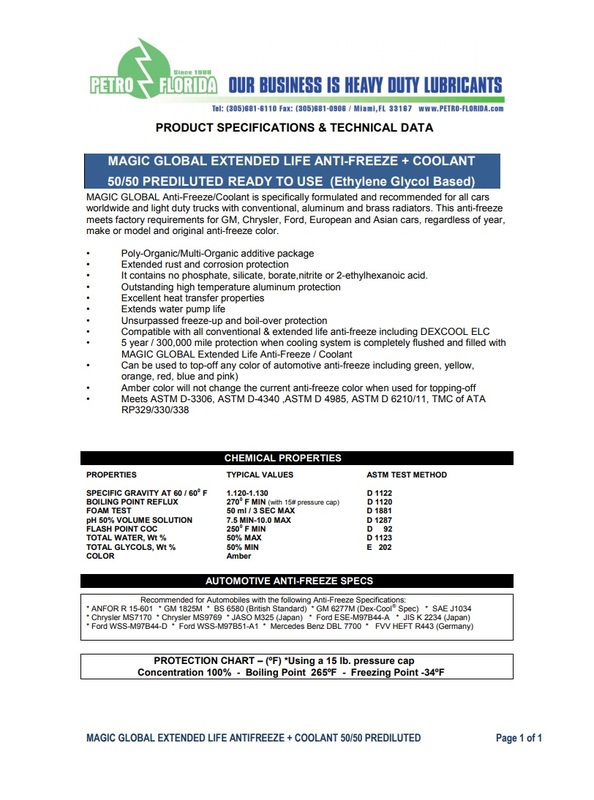 This anti-freeze meets factory requirements for GM, Chrysler, Ford, European & Asian cars, regardless of year, make or model & original antifreeze color. Poly-Organic/Multi-Organic additive package/Extended rust and corrosion protection. It contains no phosphate, silicate, borate, nitrite or 2-ethylhexanoic acid. 5 year / 300,000 mile protection when cooling system is completely flushed and filled with MAGIC GLOBAL Extended Life Anti-Freeze / Coolant. Can be used to top-off any color of automotive anti-freeze including green, yellow,orange, red, blue and pink. Amber color will not change the current anti-freeze color when used for topping-off.